Sportsman of all type count on Old Glory Gun Safes to design and manufacture the finest Gun Safes in the world. Our safes protect your valuables when you cannot. 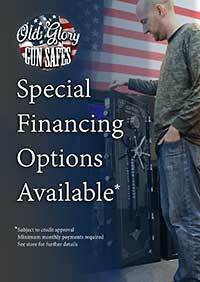 From fine shotguns, customized pistols, competition rifles and handguns to exotic hard to find guns. Our Old Glory Gun Safes were built with your weapons and equipment in mind. We offer safes that can store guns, fishing rods, salt water reels and other expensive items that a Sportsman would generally maintain. Why not store all your sporting equipment is a fine Sportsman Gun Safe from Old Glory Gun Safe Company.